good flushers. | wull hay. April 24, 2011 April 24, 2011 / rach. But it was over the hill [in Idaho], which means that all the beautiful parents and their beautiful children come out of the woodwork and you realize there MUST be something in the Idaho water. I helped with the children’s activities and preciousness just abounded. – Mom, you can wait for me outside, okay? I only have to go pee-pee. Okay? Go outside! – Okay, I’ll be right outside. – Oh! That’s a nice flush! – Haha… Why, thank you. – Well, that’s a nice flush, too! They must just have good flushers here. I walked out before I caught a glimpse of the little one… but, my goodness, she made my night. Happy Easter from a woman who likes to hope that somewhere in her is the preciousness of a little girl in wonderment over simple joys, gorgeous friendships, rare beauty and good flushes. 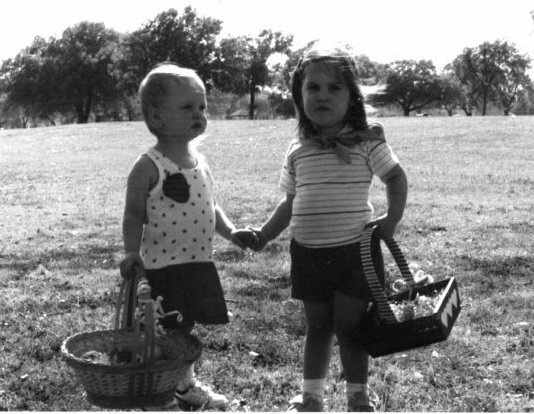 lisa and myself, easter 1987. i don't know how many times i've posted this precious picture... but i'm not sorry. Which I believe is absolutely true. So this morning, I looked back at so many Easters past and really looked at who I am… trying to do some realizing. Looking back at Lisa, my family, Easters alone, with friends and Skip-Its, with strangers in Australia, the Easter Sunday I discovered mimosas, the Easter Sunday where dad rhymed “purple” with “maple syurple”… and on and on. And maybe you think I’m self-consumed to be thinking of myself on a holiday so holy and so blatantly about a savior [either Jesus or the Easter Bunny]… but I decided I’m not sorry. My love for you comes from my appreciation of life, which usually comes from happiness, which [as my tea bag states] comes from a realization of who I am… which is terrifying. But I assure you I will wear an Easter dress at some point today… probably yellow. amazing friends., everythings., excitement inside., hollerdays., kindness., love., memories., mi familia., preciousness. ← wanting me to move.